Lama Sherab Dorje and Ivy Loo traveled with His Holiness Orgyen Kusum Lingpa from Beijing to the "Blue Valley" Buddhist Monastery in a remote part of Golok, Tibet. There we attended a five-day intensive aspiration prayer festival organized by Ven. 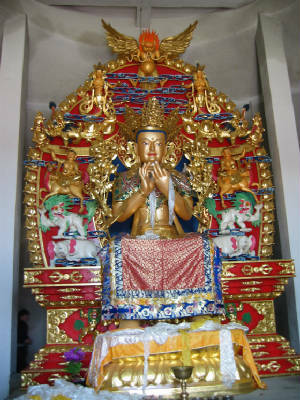 Hung Kar Dorje Rinpoche. Over a thousand monks and honored guests from all over Tibet and many foreign countries participated, including Ven. Kathok Moza Rinpoche, the supreme head of the Kathok (Nyingma) lineage. While conditions were quite harsh, we were hosted with utmost kindness and attention. Under the auspices of the Gesar Charitable Foundation, Lama Sherab visited the ShaGong elementary school for impoverished Tibetan children to gather information necessary for fundraising through the Golok Blue Valley Foundation in the United States. Pictures will be uploaded shortly -- or email us for more information. We then journeyed to Lhasa and the surrounding region, visiting the holy Jowo temple, the retreat center above Tsurphu Monastery in the Tolung Valley, and Samye temple in the Loka region. Our trip was highly rewarding, an opportunity to redouble our dedication to subdue our own troublesome negativity and to bring the profound training and healing techniques of the Buddhist tradition to the communities we serve.